We had so much fun at our family fun day, we are hosting a Tropical Summer BBQ at our centre! We want to open our doors once again to you all for a super fun day of colourful fun, food and entertainment!! For the kids: A bouncy castle, parachute games, fancy dress competition, a drawing competition, a super fun tombola, face painting and delicious BBQ food! For the adults: Beers, wines, tropical Rum cocktails, delicious BBQ food, good music, meet new friends, relax whilst we entertain your children! Our Tropical Summer BBQ is being held at our new centre, at 140 High Street, Uckfield, East Sussex TN22 1QR. Please access this from around the side at the Grange Road entrance….follow the balloons! 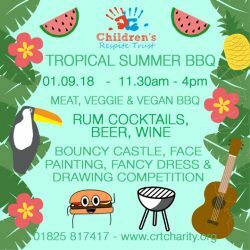 We will be raising funds on the day towards providing the care for our centre – through donations for the delicious BBQ which will be manned by the lovely Simon and Dan! Our bar will be manned by Keely and you will have a chance to purchase refreshing beers, wines and rum cocktails. There will be further chances to donate through turns on the bouncy castle, getting your face painted, and entering into the competitions run by the lovely Ann-Maire and Faiza. If you would like to volunteer for the event or donate a prize for the tombola please get in touch with Keely on: keely@crtcharity.org or phone her on 01825 817417. For more information on the day and ways you can get involved, contact Keely on the above details.